I tweaked the ears to show that the inside edges have curves and are not plastered against her head, and I also gave a better suggestion of where the ear creases from the top: it’s a sweep that begins closer to the head than the midline of the top of the ear. Just little things, but it’s lots of little things that make up effective observation. That’s why I didn’t stop there, but tweaked again. Then I realized that I’d made her ears too symmetrical. When one looks distinctly lobed at the bottom, the other tends to look more rounded, without that ‘pinch’. So I swiped at the chalk again and dated this one the 9th, though in fact it’s still the 8th. And NOW, I’m DONE! Time to move on. Here I’ve made a few changes to the image: the flews are fuller and less pinched at the bottom, and I’ve smoothed or rounded the flews as they meet beneath her nose. The nose also has had detail added and the form has been refined. I like both images: the first is more like a linocut, the second more like a pencil sketch. This morning Betsy and I stared at each other: she was watching to see what my next move would be, and I was tracing her major head shapes with my eyes, trying to learn them. Put another way, I was trying to memorize her geometry. I didn’t draw her till this afternoon, though. This is what — with many finger swipes — I ended up with. The chalk is just plain blackboard chalk, with rather a dull point, but I rather like the radiant if smudgy result. The chalk is pink but the light from the window makes a bit of it glow like a flame. The glue for the keyboard glitter besmirched the black keys somewhat — it clumped, and I didn’t want to rub the paper too much to smooth it out — but the effect is still good. Watercolour markers, ink, coloured pencils, and insoluble markers, with charcoal and 4B graphite for the under-drawing. Colour, like flavour and texture: why do we like it? My favourite colour has always been ‘blue’. But not this blue, left, even though I do like navy in small doses. Not my favourite colour tones, by any stretch. These look yellow-browned and opaque: I prefer colours like jewels, with white light apparently glinting through them. And certainly not THIS blue, at right, which I honestly don’t care for at all. It’s like the blue in the Google logo, which seems jollier only because it has other colours to bring it along, so to speak. So which blue? Well, anything from eggshell blue to translucent turquoise blue to the brightest blue of the sky. Something nearer cyan: a greenish blue. And then there is red. Upshot: I love slightly greenish blues — greens that themselves have some yellow-white, bright and lustrous — and for reds, I like bluish ones. I clearly favour one side of the visible spectrum over the other. The question is: WHY? A Changing View: when I started working on this, the clouds were less grey on their undersides, and less plainly rain-laden. So this picture shows, from left to right, the view of the sky as it changed before my eyes. The mountains were outlined first but coloured last. The only pastels are in the sky. Cloud patterns (and sky colours) over the mountains are often enormously varied and complex, and this picture captures that. Here I worked with pastels and a bit of watercolour (pencils and paints) on Canson Mi-teintes pale blue paper. I chose the more textured side just because I thought it would grip the pastel better. It didn't really grip at all -- if I hadn't been told this was paper for pastel I would never have guessed -- and I don't care for the mesh effect, really (clouds don't have grids, do they?). So this clearly won't be my go-to paper -- and when I do use it next time, I'll be sure to use the smoother side! Watercolour on Arches hot press paper. 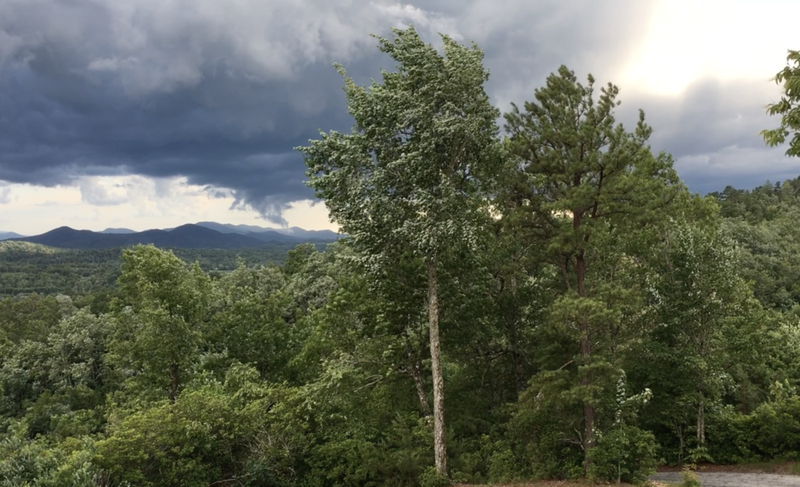 Last full day in the Smokies, and I loved the look of clouds reaching up like larkspurs or turrets. So I had to paint them. ... in watercolour paint (sticks and half pans), gouache, pastels, watercolour pencils, non-photo blue pencil, and ink. The right side, with the detailed ridge with all its trees, is a deliberate contrast to the left, in which I indicate space and distance without wanting to 'fill it in'. So this picture accomplishes the objective of closely observing and recording what I actually saw, while keeping the scene open and airy and not being a slave to the masses and masses of indistinct detail. Here I picked out what I wanted to look at and what I wanted to recall. The rest is an impression that highlights the importance of the featured trees you see. ...but the light grey-blue will need to be re-done with more of a baby blue. That is why it makes sense to see the yarns woven into an actual sample. The light blue of the computer mock-up (below) is what I had in mind, though the purplish 'pink' it shows isn't right: the woven one is. I can't seem to get enough of this pair of trees that stands just beyond the chalet, with mountains in the background. They are a maple of some sort (left) and a pitch pine (on the right). I like the way they complement each other, and I particularly like the way the pitch pine holds its upper leaf clusters aloft like candelabra (charmingly, the pitch pine is also known colloquially as the candlewood, for its resinous knots). These pictures in my 6" square sketchbook were made with watercolour marker. version two, still with watercolour markers but looking more like a linocut. I suppose that really I should draw these trees on larger paper, to give them some room and perhaps to stick them up somewhere on my bedroom wall. Below: a still of 'the friends' from a video I took of stormy weather. I finally got this drawing off my camera. The digital date-stamp is 20 March, and I probably photographed it if not the same day then soon after drawing. Her head is resting on her beanbag in the lanai, and I sketched this while viewing her from my chaise longue. by Arthur Hughes, a Pre-Rapahelite painter, c. 1855-56. The man in the background is weeping, and holds a rose with fallen petals. The mauve of the woman's dress was a new pigment derived from coal tar, and was 'all the rage' for a few years in the mid-century. In sum, the young lady may be disappointed in love, but she is certainly fashionable! It's a game artists often like to play among themselves -- the game of 'if you had to be in one camp or the other, would it be the colorito camp (traditionally represented by Raphael) or the disegno camp (likewise represented by Leonardo)?'. Of course from a modern perspective Raphael has it all, but other Renaissance masters sometimes were more critical, and the 'pre-Raphaelite' painters of Victorian England wanted, if I don't misunderstand their objectives, a return in painting to 'slice of life' pictures rendered in worldly detail (as opposed to otherworldly detail, in the imaginary realm of gods and goddesses). To put it another way: They wanted their pictures to be more like what we understand as illustrations, each with a story that unfolds as we take in its lifelike, carefully chosen details. The Royal Academy of Art had been holding up Raphael as a model of what painters should aspire to. But I digress. The 'colour' versus 'design' (or 'drawing' or 'lines') idea is one that survives because it is possible to create art using only one or the other. The American artist Tom Hoffman creates watercolour paintings that mainly consist of swipes by a brush, using colour to represent distance, solidity, and form (both the general shape and any details). Then there are artists that work primarily with graphite or ink and achieve a high degree of realism with it. But in the main, I think that both viewers and artists themselves feel that the pinnacle of satisfaction in art is the meeting of colour and line -- the interplay between them, with line relenting to let colour do its work, and vice versa. In short, not only do I as viewer and artist have one foot in each camp, I really think that the camps are irrelevant to what I enjoy and what I hope to achieve. To be truly delighted with an artwork, I generally require not only the presence of colour but more especially the contribution of colour to the mood and sensual appeal of the work. At the same time, colour that is highly vague, all the same texture, suggestive of nothing but art itself -- that I find to be a dead end rather than an avenue of pursuit. For me, colour really shines and takes on meaning when it has recognizable form -- when it's giving life to a design that has a place in space and time. This is one reason, maybe the main reason, why landscapes have triumphant popularity in our era: we never tire of them because we never tire of seeing arresting colour married to arresting forms. And the fact is, it's silly to think that as artists (or viewers) we have to choose: one wouldn't ask an audience after a Mozart concert whether they most admired the sound of the instruments or the notes they played: we all know that the magic comes when they work together. This box also has a fitting for a tripod. 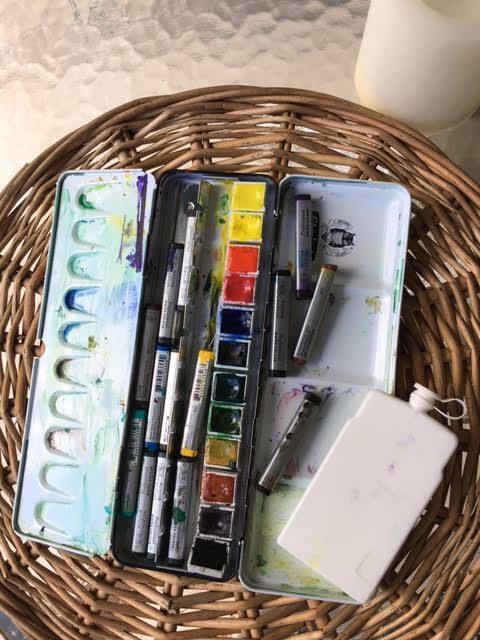 This is the Sienna plein air pastel box -- though I don't see any particular requirement for the 'plein air' bit: this would be just as useful indoors if you had no other pastel compartments and no other easel. This will however be super for summer in the mountains, when I have to leave my studio behind. On the back of the lid, unseen, is a tray that latches on to the side edge, as a work area: meanwhile it sits within the lid top and is secured by two little magnets. (See the commercial picture, below.) The provided hook can be used to dangle a cloth, as shown. On the easel for demonstration purposes: a new work in progress. I often note that in any film or book, the artwork shown 'in progress' is actually and obviously a complete and finished work! I don't know why it never occurs to movie directors that they'd be more true to life if they hired an artist not to paint the whole thing but just to paint part way and stop! Or lend, for a fee, an unfinished work. Even art books, unless illustrating step-by-step instructions, share this tendency to show finished works rather than otherwise. So there you go: I am showing the box with its adjustable edge supports, with a great deal less than halfway-through work between them! It's just basic fine-grit black sandpaper that I had on hand in my toolbox! The Richeson half-stick soft pastels, set of 24. The Mount Vision iridescent set of 15.